The kids were looking forward to it since the beginning of this month so a couple of weeks ago I have put the decorations in the house and bought them some dressing up clothes. Soufian as a Vampire/devil, Sanae as a witch, Chadi as some scary monster/ master of the dark. 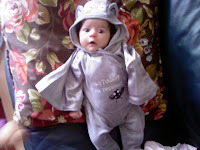 ( the photo above was taken last week when they dressed up for fun ) and for Dounya a little bat suit. 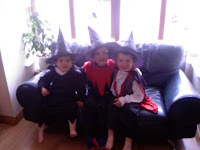 They were so excited today at the whole dressing up/ Trick or treat thing!!! They had great fun until Chadi heard the fireworks and really panicked..he can not cope with loud unexpected noises. So that was the end of it and we headed home. It was nice to see them having so much fun at their first halloween out and about although hopefully Chadi overcomes his fear for fireworks next year. And maybe by that time Dounya will trot along too!!!!!! Today it was parent/teacher interview at the primary school of Chadi and Soufian. Education is one of the things I find really important and I try to support my boys as much as I can, hoping that it will result in them enjoying school. I really think that the years in primary school are the most important because that is the time that you lay the basics. People with this condition have difficulties in three main areas. be very literal in what they say and can have difficulty understanding jokes, metaphor and sarcasm. behave in what may seem an inappropriate manner. having a limited range of imaginative activities, which can be pursued rigidly and repetitively eg lining up toys or collecting and organising things related to his or her interest. While there are similarities with autism, people with Asperger syndrome have fewer problems with speaking and are often of average, or above average, intelligence. So there you go...A lot of obstacles for Chadi to tackle. He is at the same primary school as his brother just he is in a special learning support class for children with learning dificullties. He has been there since P1 ( he is now in p2) and will stay there until p4. And I think ,and so does his teacher, that he is doing really well at the academic part but his behaviour still needs to be improved. The same thing at home, because he can be a handfull ...well 3 handfulls even. But I see much progress since last year so keep up the good work little man!! We will get there! Soufian is doing very well. He is really creative and very social and loves to try out things himself. It usually means that things what he gets his hands will be dismantled....or gets broken!!! ( MMM....... THAT IS EXPLORING THE WORLD AROUND YOU ...) But he is a great boy and really funny sometimes. I am proud of my boys and I hope they will continue to do well. Next year Sanae will join them at school when she will start nursery..I am looking forward to see how she will do! Today was a check up day again for Dounya, here in Craigavon Area Hospital. I was not really looking forward to it . I was sure that she had lost some weight due to her poor feeding last week when she had the chest infection. She barely drank milk for 2 days and then she started slowly to drink more again. These past 2 days she drinks really well, she is now on 70 ml every three hours..a bit less during the night '' because I wanna sleep mummy...'' . But it went better than I thought!! She gained 80 grams(!) which I think is good when you put in account she was sick. and the infection is all cleared up. The paedetrician thought she was really looking settled, satisfied and alert, so good news alltogether. 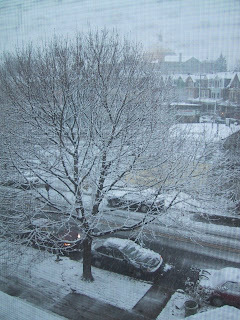 Something else: SNOW IN OCTOBER???????????? Today I had put my mind on cleaning the house (again.....grrrr) from top to bottom. So I had my task set but our Sanae was not her self today...yep she too caught te bug which has a grip on our entire household these last weeks. So our little ray of sunlight had turned into a thundercloud this morning all weepy and grumpy. When she finally fell asleep on the sofa and Dounya as well in her basket I could get on with things. I was nearly finished when the phone rang and a lady of an organisation called Surestart asked if she could call around later in the afternoon to register me and see if there were some activities I would be interested in. It is an organisation who have all sorts of activities for babies and toddlers and their mums ( and dads). So it sounded interesting enough and I agreed that she could come at 2.30 pm. It was a very nice lady who worked as a health visitor as well . We talked about a lot of things like Douya her condition, Chadi's learning disabillities ( he has Asperger syndrom ) my working background in the Netherlands and courses I could follow here etc. and ofcourse about some activities I could do with Dounya and Sanae. They have playgroups for the wee ones while the mummy's can have a quiet cup of coffee, baby massage ( lovely for Dounya) dancegroups for toddlers and loads more. So I might try some out!! I am not sure if I am but it is really nice when somebody thinks that of you. Since I am not working anymore and not doing some kind of study, sometimes I feel like I have come to a stand still. I would love to pick up some study in Social work again and go back to work. But at the moment those are things for the future, when Dounya has had her surgery and all is well. To all who put a comment on this blog: THANK YOU I really like to read them so keep on doing it!!! I was thinking just now how odd it is that you start caring much more for other people when you are confronted with ilnesses yourself. Before Dounya's birth I didn't know much (zero) about Congenital heart diseases and now I found that there are so many!!! I have heard of heart murmurs and a 'hole ' in the heart but did not know exactly what it meant. Through Heartline I have learned so much..not only about the different conditions but also about courage and support. Living here means that we have not a real support network around us. Jamal has one brother living here and we have some friends but everybody got enough things on their own plate. And I don't want to feel like I am a burden to someone. So mostly Jamal and me depend on each other. Because I am the sort of person who wants to talk about her feelings and Jamal is more closed I am happy that I have found different ways to express my thoughts and fears. So I am 'blogging' away and nearly every evening checking heartline. That's my way of coming to terms with Dounya's condition. It is a long road ahead of us, and a rocky one but I hope Dounya will come through all of it fine. Luckily she is not aware of the things that are waiting for her in the future.. When she gives me her ' 1 million smile' and she looks at me so trustfull it breaks my heart that she will to go through something major as a surgery when she still is so small..but hopefully it will go the way it should and she comes out as a healthy little girl...time will tell. She is fast asleep now with a smile on her face...she must be having a beautiful dream!!! Saturday morning 16 augustus 2008 at 00.55 our beautiul daughter Dounya was born in Craigavon hospital, Craigavon, Northern-Ireland. Everything seemed right, but she was already special because of the birthmarks on her little behind...mongolian blue spots they are called. Never heard of it before but they say it is common with children from mixed races. They will disapear when she is growing up though. Dounya got her little checks and everything was fine so we went to the maternity ward and because her delivery was straight forward I was thinking we would leave the hospital Sunday. But when the paeditrician checked her during his round sunday morning he picked up a murmur in her heart...and our journey in the unknown started. I could not leave the hospital with Dounya until she could be seen by cardiac specialists in the Royal Victoria hospital in Belfast where they have a special children's unit called the Clarke Clinic. The doctors did a lot of checks with her and they found that she had a congenital heart disease called Atrioventricular septal defect ( AVSD). She will need a mayor surgery..an open heart surgery. It sounded all so scary and I have to admit I broke down in tears . They told us that although it is a major surgery her AVSD seemed to be straight forward and therefore good to fix. But we should be prepared for Dounya getting more and more breathless, feeding problems, and poor weight gaining before the surgery. They could not tell us as yet when her surgery will be but probably before she is 7 months old. It all depends on how she will grow and if she stays stable enough. The first days after the news I felt a bit lost an found myself searching the internet about Dounya's condition. But when I read al those stories and facts it felt like it had nothing to do with Dounya because at that moment she was still doing very well. That soon changed unfortunatly.... and all became very real. August 25 started fairly normal. The two eldest boys went to school and I was at home with Sanae and Dounya. The evening before I noticed that Dounya was breathing quite fast and I asked Jamal if he noticed that too. Was it beginning? So soon already? ?We thought the best thing was not to panic, because the doctors had warned us this would happen. So I went there in craigavon hospital were they did a x-ray, an ECG and checking her SATS. It was not the way it should be.. Dounya was in heart failure which basically means that her heart was not coping. The doctors said that she was looking well for a baby in heart failure, not blue or pale but pink!!! The weight she gained was not proper weight but fluids that her body could not get rid of . She was sent up the childrens ward and put on the monitor. Dounya was put on medications to get rid of the fluids in her body and one to stabilise her heart rate. she was feeding poorly and after 3 days she needed a tube through her nose directly in her stomach a so called NG tube. I was juggeling my time between home and hospital, trying to be with Dounya as much as I could. It is hard to have a newborn but you can not take care of her yourself. Every day I hoped for the news that we could take her home...it took 13 days before it came and I was over the moon when they said the tube could come out too!! She is still on medication ( digoxin, furosemide and spironolactone) and has to drink a special high calorie milk called infantrini. She is slowly gaining weight. At the moment she weighs 3700 grams but she caught a chest infection this week and was not drinking well for 3 days so probably she lost a bit. FINGERS CROSSED IT IS NOT TOO MUCH!!! But she is doing fairly well at the moment...our little fighter.